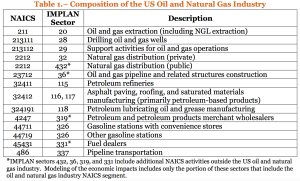 Table 1 of this report, which is reproduced below, defines the scope of the U.S. oil and natural gas industry included in this analysis. The U.S. has over 200,000 miles of liquids pipelines that, in 2014, transported 16.2 billion barrels of crude oil, petroleum products and HGL. 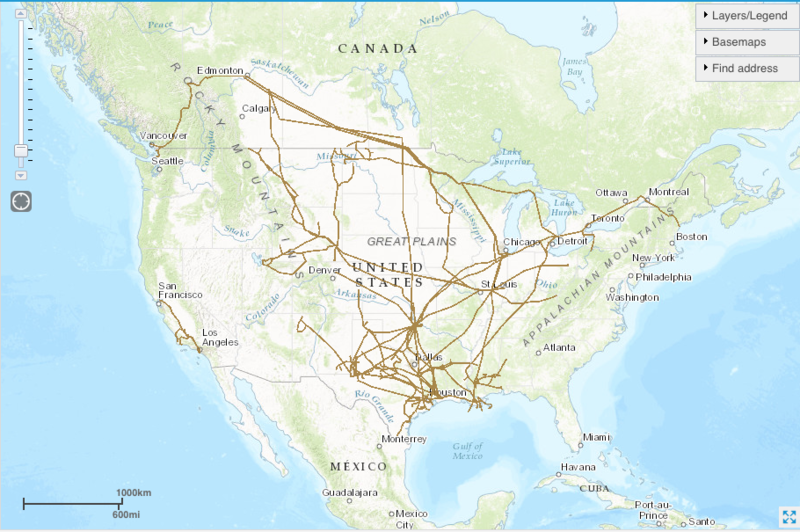 More than 17,000 miles of liquid pipelines were added to the network in the five-year period from 2010 thru 2014. 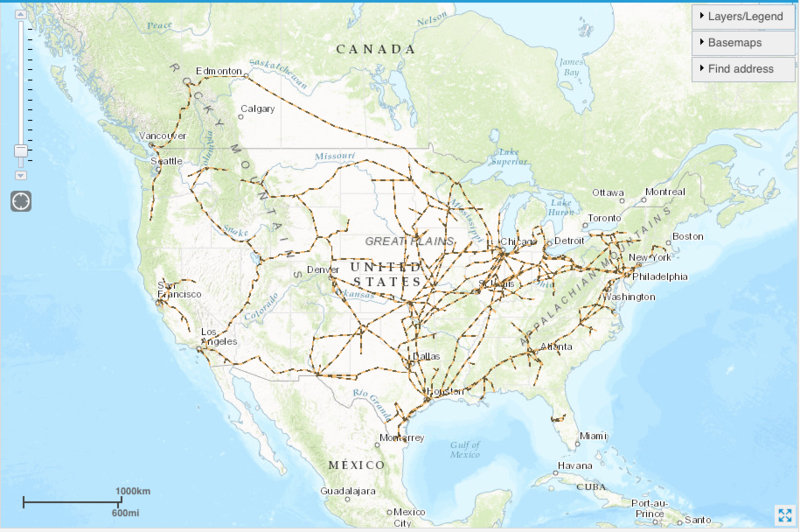 The U.S. has over 300,000 miles of interstate and intrastate natural gas transmission pipelines. 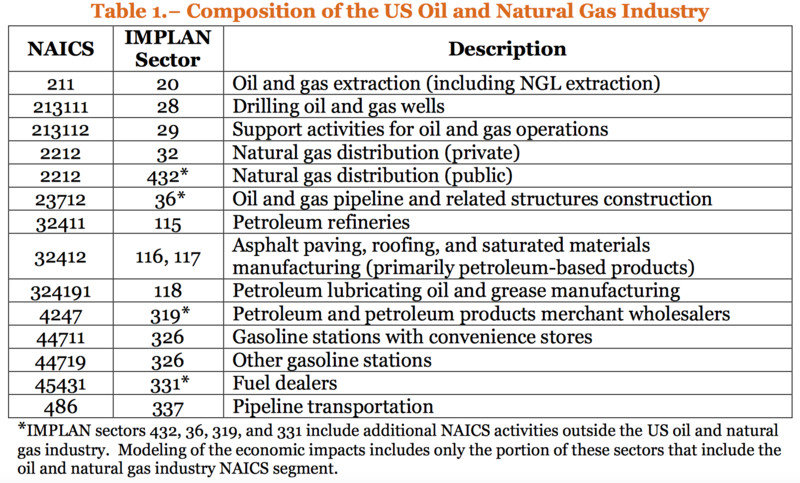 That’s adds up to more than a half million miles of major oil and gas pipelines in the U.S. Most pipelines are installed underground, with pumping / compressor stations at grade level. The Trans-Alaska pipeline system is a notable exception, with its above-grade pipeline in permafrost regions. 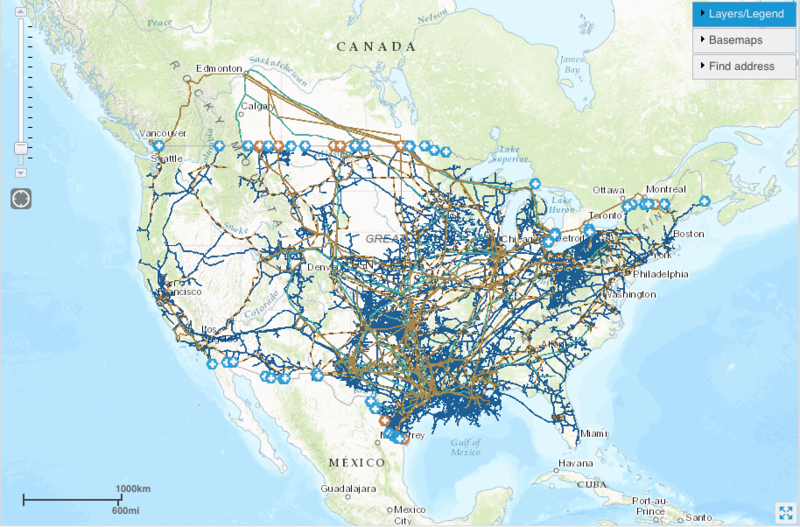 The following maps prepared using the U.S. Energy Mapping System show the distribution of oil and gas pipeline systems in the U.S. (except Alaska & Hawaii) and Canada. The source of pipeline mileage data is the Pipeline and Hazardous Material Safety Administration (PHMSA). The source of liquid capacity data is the Association of Oil Pipe Lines (AOPL). The petroleum product pipelines and the HGL pipelines together delivered 6.9 billion barrels (bbl) of products nationwide in 2014 (AOPL). 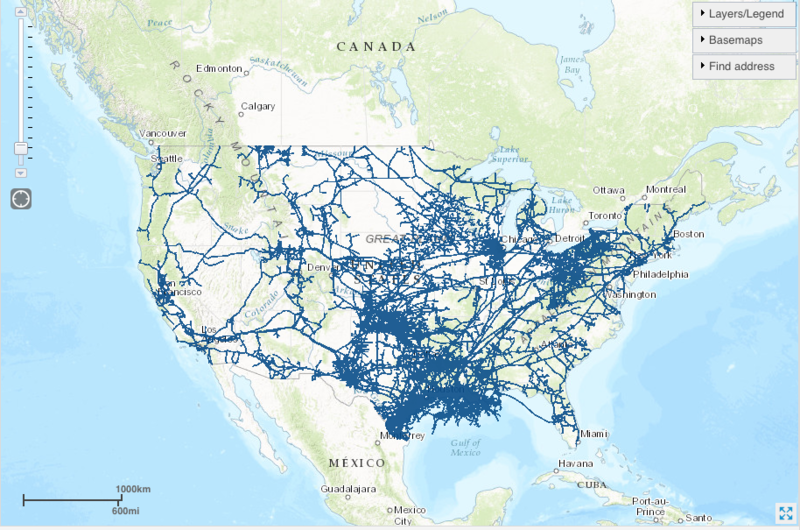 The high density of pipeline systems in many parts of the nation is evident in the last map. 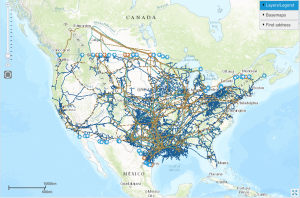 On the EIA’s U.S. Energy Mapping System website, you can recreate and explore any of the above maps. 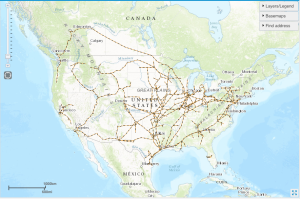 The Department of Transportation’s (DOT) Pipeline and Hazardous Material Safety Administration (PHMSA), acting through the Office of Pipeline Safety (OPS), administers the DOT national regulatory program to assure the safe transportation of natural gas, petroleum, and other hazardous materials by pipeline. 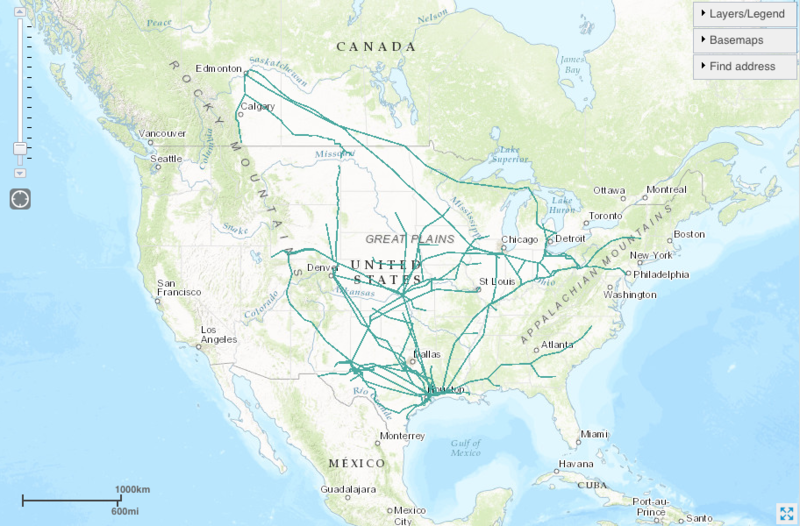 PHMSA has collected pipeline incident reports since 1970. PHMSA defines “significant incidents” as any of the following conditions that originate within the pipeline system (but not initiated by a nearby external event that affects the pipeline system). 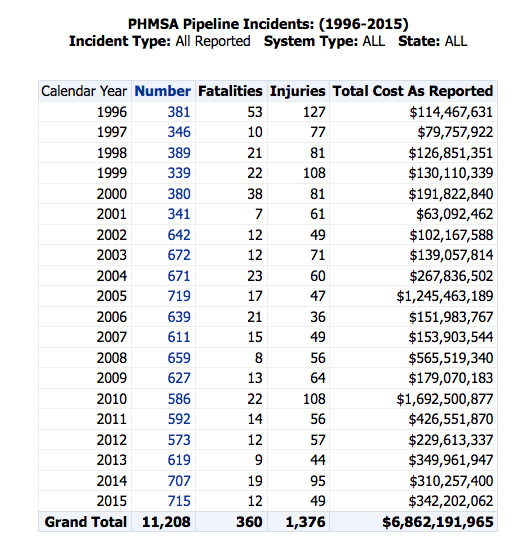 A summary of all reported pipeline incidents over the past 20 years is presented in the following PHMSA table. 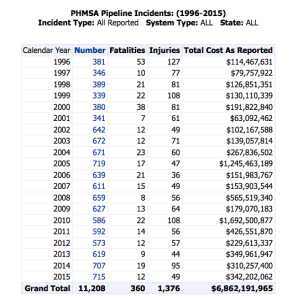 Clearly, the oil and gas pipeline business is quite hazardous, and the economic cost of pipeline incidents is very high, even in an average year. Since the mid-1990s, the number of incidents per year has almost doubled (367 average for 1996 – 2000 vs. 641 average for 2011 – 2015) as has the total cost per year ($128.4 million average for 1996 – 2000 vs. $331.6 million average for 2011 – 2015). Over the five-year period, 168,000 barrels (more than 7 million gallons) of crude oil were spilled as a result of reported incidents. That’s an average of about 1.4 million gallons (33,600 barrels) per year leaking or spilled from 73,300 miles of crude oil pipelines that delivered 3 billion barrels of oil annually in 2014. That annualized amount of leakage also is equivalent to the amount of oil carried in about 47 DOT-111 rail cars. Commonly reported causes included poor material condition (corrosion, bad seals), weather (heavy rains, lightning), and human error (valves being left open, people puncturing pipelines while digging). Many of the spills were small, releasing less than 10 barrels (420 gallons) of oil, but a few were much larger. For example, a 2013 lightning strike on a North Dakota pipeline caused a 20,000-barrel (840,000 gallon) leak. Cleanup after these spills and leaks is included in the PHMSA total cost data. Using PHMSA data, the author mapped the age of the U.S. pipeline infrastructure and determined that, “About forty-five percent of U.S. crude oil pipeline is more than fifty years old.” The following chart shows the age distribution of U.S. crude oil pipelines. In April 2015 Administration issued the First Installment of the Quadrennial Energy Review (QER 1.1). 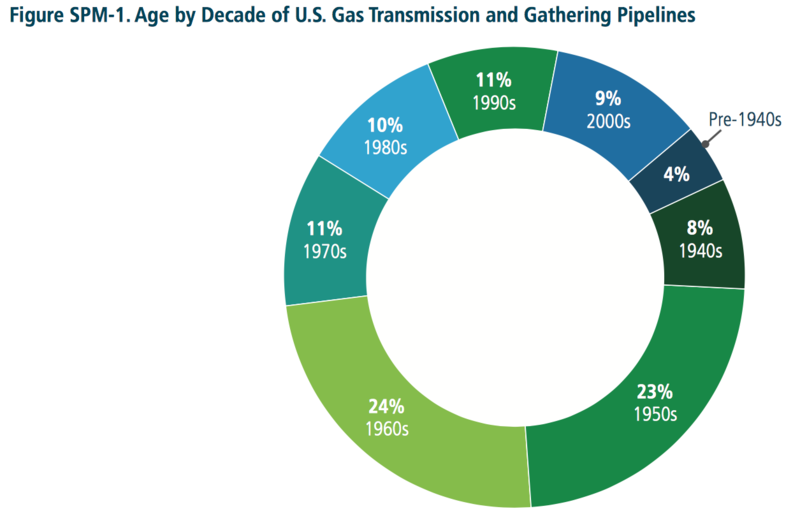 This report included the following chart showing the age distribution of U.S. natural gas transmission and gathering pipelines. 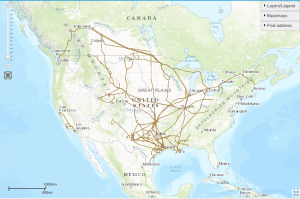 It looks like more than 50% of these natural gas pipelines are more than 50 years old. 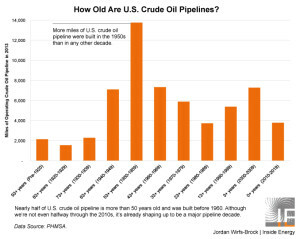 The high percentage of older pipeline systems places the overall integrity, reliability and safety of the critical national pipeline infrastructure at risk. In a previous post, I described the Quadrennial Energy Review (QER) initiated by the Obama Administration in January 2014. The first QER report, QER 1.1, released in April 2015, provides a good overview of issues related to oil and gas pipeline system risks and opportunities to modernize this critical infrastructure. One positive step was taken on 16 April 2015 by the Federal Energy Regulatory Commission (FERC) when it announced a new policy, Cost Recovery Mechanisms for Modernization of Natural Gas Facilities. This policy sets conditions for interstate natural gas pipeline operators to recover certain safety, environmental, or reliability capital expenditures made to modernize pipeline system infrastructure. Given the scale of the national oil and gas pipeline infrastructure, and the age of significant portions of that infrastructure, it will take decades of investment to implement system-wide modernization. The political climate, economic climate, and maybe the stars need to be in alignment for this enormous, long-term modernization effort to deliver the needed results.